In this, the third in her trilogy of novels involving international intrigue set in Missoula, Montana, and Ireland, author Mary Pat Tuxbury of Florence, Montana, brings to dramatic conclusion the story of Amanda Collins, a Missoula widow who has found herself caught in the midst of a perplexing and, ultimately, terrifying drama. In Mary Pat Tuxbury's first two novels in the trilogy, “A Proper Cup of Tea” and “Riley's Legacy,” the recently-widowed Amanda became involved with a charming Irishman, Sean Riley, who in turn was killed in a terrorist bombing in Dublin, leaving Amanda as the sole heir to his fortune. The catch is that as the story of “Irish Phoenix” is unraveled, we learn that Sean Riley was not killed in the incident and that he secretly was a leader in the terrorist movement. And, when his “return from the grave” enables Amanda to learn the truth about his involvement as a terrorist, Amanda, by now back in Montana, herself becomes caught up in the life-and-death terror. In this exciting novel, Amanda and her friend Mary Murphy, and a local attorney, Michael Rafferty, search for the truth only to uncover a conspiracy that runs all the way to the top. But they also quickly learn, as they pursue their quest to learn the truth that you never know who you can trust – right up to the very end . 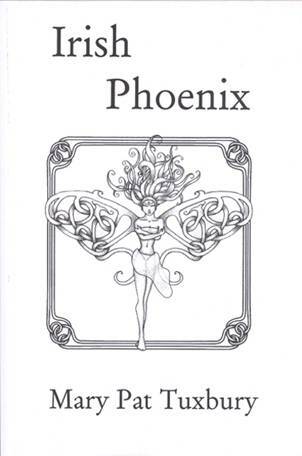 “Irish Phoenix” was issued in 6x9-inch format, softcover, 200 pages.